Achieving the highest level of application performance requires a combination of both data center and network optimization. In the data center, Array load balancing and application delivery solutions offload compute-intensive functions such as SSL encryption and connection handling from servers, enabling them to operate in their power band for maximum application performance. 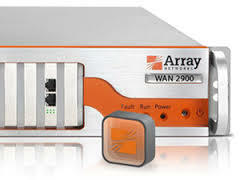 Across wide area networks and Internet connections, Array WAN optimization solutions compress and reduce application traffic to improve response times by 10x or more. For maximum application acceleration, Array’s application-aware load balancing and application-specific blueprints for WAN optimization provide a layer of application intelligence that further tunes performance and speeds data transfer from anywhere, to anywhere. Load balancing offloads compute-intensive functions such as SSL encryption and TCP connection processing from servers, enabling them to operate in their power band for maximum efficiency and application performance. In addition, integrated server-side acceleration functions such as connection multiplexing, in-memory caching, adaptive compression and traffic shaping may be applied to further accelerate application response times to any user, anywhere, without the need for client software. WAN optimization reduces response times for applications accessed over wide area networks by minimizing the traffic that travels between remote offices and data centers, public and private clouds, and remote users. By mitigating the effects of limited bandwidth, high latency, packet loss and network congestion on application performance, WAN optimization reduces end-user response times by up to 95% and ensures a LAN-like experience regardless of where users access applications and data. Every enterprise application, cloud service and back-up and replication scheme has unique requirements. By leveraging application-level intelligence, load balancing and WAN optimization solutions can be tuned for maximum performance. Certified and validated deployment guides ensure optimized load balancing and application delivery settings, and application-specific blueprints allow WAN optimization to recognize application traffic and apply the correct mix of acceleration functions. eCommerce: Processing SSL traffic generated by e-commerce transactions consumes a significant number of server cycles due to bulk encryption requirements and new compute-intensive 2048-bit SSL standards. By offloading SSL encryption from servers to dedicated load balancing appliances, retail and e-commerce businesses can do more with less while maximizing the performance, availability and security of their online operations. Enterprise & SaaS Applicnsatio: Whether delivering enterprise applications to users at remote branch locations or delivering software services from the cloud to end-user customers, performance is key to driving productivity and user satisfaction. By combining load balancing and application delivery with WAN optimization, performance can be accelerated end-to-end from the data center to end users for any enterprise application or cloud service. Backup & Replication: WAN optimization improves the performance of today’s leading backup and replication solutions, such as Dell EqualLogic, IBM Tivoli Fast Back and Storage Manager, NetApp SnapMirror and many others. In addition to reducing time windows for backup and replication, WAN optimization can assist business continuity and disaster recovery efforts by accelerating recovery in a manner that is both efficient and cost-effective. Mobile: Because WAN optimization appliances are not cost-effective or practical for remote users, a mobile client is available to accelerate traffic between individual devices and WAN optimization appliances in the data center or cloud. Through Array mobile clients, bandwidth consumption is commonly reduced by 60-95% and files download up to 20 times faster to produce a computing experience optimized for higher overall productivity.